The physicality of the ceramic media is an integral part of my everyday liveliness and identity. As a result, it is imperative that my work reflects this synergy. I define myself as an energetic, passionate person striving for balance and harmony in my life and in my creative work. It is important that I leave my mark on the surface of the vessels I create to express this personal involvement with each piece. The touch of my hand or a fingerprint left on the surface are all aspects of this interaction. 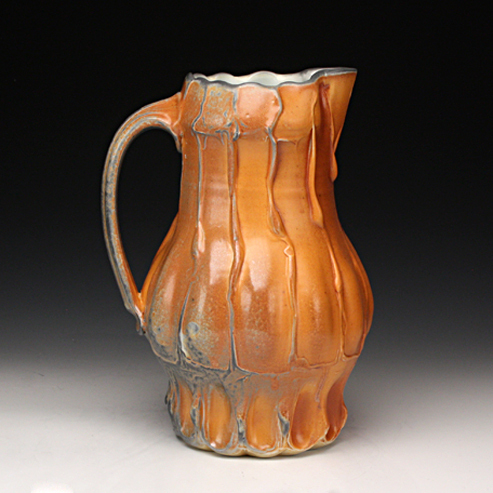 Thick slips are added to the outer surface of my vessels, creating soft, fluid contours. These luscious lines accent the form, alluding to graceful movements of a feminine gesture. I begin to develop the form from within: stretching, pushing, and pulling the clay outward, creating internal volume and strength. My vessels convey an inner quality or core–a breath–full of energy and full of life.